The 2007 National Scholastic Surfing Association (NSSA), Championship Series presented by No Fear. (Huntington Beach, Ca) - Nine days, 82 hours, 358 heats and over 1,000 competitors later and the 2007 NSSA National Championships is in the books. In what has been pegged as the Super Bowl of youth surfing, the NSSA Nationals once again set the grandest stage for the most powerful, dynamic and unprecedented performances from the finest amateur surfers across the nation. The National Interscholastic Championships and National Explorer preliminary rounds were held at Salt Creek June 20-23. The contest shifted to the ultimate surfing arena at Lower Trestles where the National Explorer Championships continued along with the premier event in amateur surfing-the National Open Championships. The waves were a fun, contestable 2-3 feet at the Creek. Lowers came through as usual delivering terrific chest to shoulder high performance peaks throughout the five day event under beautiful sunny skies. And this year thanks to the live webcast presented by Nike 6.0, surfing fans worldwide had the opportunity to watch the action and experience the electrifying atmosphere of the highest profile event in youth surfing. To no one’s surprise, the Hawaii field took its toll on the East and West coast contingent. The Hawaiians came out swinging taking 4 of 6 titles in the Open division. They dominated 22 of the 32 finals spots in the Open category and 29 of the 32 finals slots in the Explorer scholastic categories. Open Men’s champion Tonino Benson was absolutely killing it from day one at the Creek and Women’s champ Carissa Moore was phenomenal claiming her 10th and 11th National titles while showing why she is already a NSSA legend at 14-years-old and destined to be a world icon in the sport. NSSA HERO AND FUTURE WORLD TITLE CONTENDER CARISSA MOORE. The Nationals witnessed a new kid on the block by the name of Alessa Quizon. Alessa just started competing in the NSSA Hawaii conference this season and in her very first Nationals quickly exceeded all expectations with a clear-cut victory in the Explorer Girls division beating the division heavies Carissa Moore and Malia Manuel. The 13-year-old from Hauula quickly stamped herself as a new force to contend with at the Nationals. GOVERNOR'S CUP CHAMPIONS CARISSA MOORE AND TONINO BENSON. For the seventh consecutive year, the NSSA partnered with the California State Parks in presenting the prestigious Governor’s Cup trophy to the winners of the Open Men’s and Women’s divisions. Tonino Benson was presented the Governor’s Cup in the Men’s category and Carissa Moore claimed her fourth straight Governor’s Cup in the Womens. Many thanks to the State of California, Governor Arnold Schwarzenegger and the California State Parks for supporting the National Championships and our commitment to education and scholastic surfing. FINALLY! ANDREW RIPPING TO HIS FIRST NATIONAL TITLE. KEALA NAIHE MADE A BIG IMPRESSION IN THE FINALS. At the 2006 Nationals, Kealamakia Naihe didn’t make it past the quarterfinals in either the Open Boys or Explorer Menehuenes. What a difference a year makes! The 13-year-old from Kailua-Kona cemented his reputation as one of America’s top groms with a stellar performance at Lowers. Naihe put on an incredible exhibition in the Open Boys final destroying a 9.0 scoring right which brought the beach to their feet. He also earned a near perfect 9.5 score in the Explorer Menehuene final barely missing out on another title. "I knew I had to wait for the better waves and not go for the smaller ones,” a beaming Naihe said after the Boys final concluded. "I decided to stick with the rights and it ended up working good for me. I got lucky and just happened to be in position when the set came in. I didn’t fall and rode it pretty well.” Naihe’s standout combination of big moves and polished style earned him the annual "Kalani Robb Most Inspirational Performance” award. Kolohe Andino edged out Naihe in a super tight 14.00-13.75 nail-biter to take the Menehuenes. Andino also won the Middle School Boys division at the National Interscholastics at Salt Creek sealing his fifth career National title. It’s not the norm to mention the word power and Mini-Grom in the same breath but Benji Brand proved to be the exception. The 11-year-old South African native showed us his serious potential with heavy-duty top turns rivaling the Juniors division kids. Hawaii’s Ian Gentil was also ruling the Lowers peak and the two went blow for blow in the final with Brand receiving his first taste of Nationals glory by a half point. "It was really close, I’m really happy,” Brand said. "I was shaking when I heard it announced that I won. The final was so tight. I was waiting for the sets but there was kind of a lull so I went for this smaller right and it came in as a 6.25 which was one of my best scores. At the five minute, I got another good right and that was the one I won on.” Brand and his family reside nine months of the year in Hawaii and three months in his homeland in South Africa. "My dad moved my family to Hawaii so we could do the NSSA contests and become better surfers,” Brand said. 20 YEAR DROUGHT ENDS FOR AZTECS - In NSSA tradition, the National Collegiate Championships kicked off the 2007 National Championships with 11 teams competing from the East and West coasts. After a mediocre fifth place finish at the 2007 State titles, San Diego State came to Nationals with guns blazing and claimed their first title since 1987. SDSU team member Jon Flick led the charge for the Aztecs claiming his first National title after more than a decade of attempts. "This is my first title and I’m so stoked,” shouted the excited 24-year-old Florida native. "I’ve been surfing the NSSA for nearly my whole life and I’ve never won the Nationals. I’m so happy!” Lauren Sweeney banked her third straight title in the College Women’s division and Billy Harris successfully defended his Collegiate Longboard crown. SHORECLIFFS RULES AGAIN – Shorecliffs Middle School remained unstoppable claiming their second straight Middle School National crown. Team members Kolohe Andino and Ian Crane delivered the one-two punch in the Middle School Boys final while Eli Gillis took the Longboard title. Kapaa Middle School was runner up in the best showing ever for a Hawaii school at the National Interscholastic Championships. Team member Malia Manuel clinched her first National title winning the Middle School Girls division. 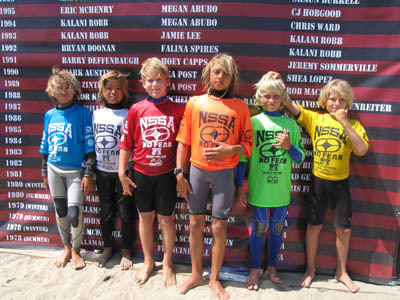 THE FUTURE OF OUR SPORT-THE MINI GROM FINALISTS!